North Carolina General Statute 106-877 authorizes the North Carolina Department of Agriculture and Consumer Services through the North Carolina Forest Service (NCFS) to “operate forest tree nurseries and seed orchards,” with products coming from them to be sold to landowners for reforestation and afforestation. Since 1924, NCFS has been actively engaged in such production with the purpose of providing native forest tree seedlings of the highest quality for deployment across every region of North Carolina. By doing this, NCFS serves as a stable provider in the often volatile tree seedling market, ensuring access to a reliable supply of the best genetic selections at an affordable price. The N&TI Program is composed of two linked but separate operations. The first is the Nursery Program, which is tasked with planning, growing, selling and distributing the annual seedling crop. It is a receipted program, meaning it receives no tax revenue through state appropriations. The second part of the N&TI is the Tree Improvement Program, which is tasked with developing improved selections of key tree species that are of high economic value to forest landowners. Examples include: Loblolly Pine, Longleaf Pine, Shortleaf Pine, Eastern White Pine, and Atlantic White Cedar. The long term efforts of the Tree Improvement program have resulted in dramatic increases in volume growth, disease resistance and physical properties of these species. The Tree Improvement Program is appropriated and receives funding through the annual budgeting process. With an average annual production of 15 million seedlings, the Nursery Program produces enough tree seedlings to plant at approximately 30,000 acres of land each year. The number of species grown annually varies due to seed availability, (typically 45-50). Goldsboro Forestry Center is the hub of operations for both the Nursery Program and the Tree Improvement Program. The Nursery uses only seed from native North Carolina trees to produce geographically suitable material that is locally adapted. To meet the needs of a diverse customer base with unique objectives, both bare root and container grown products are available. Container grown seedlings with intact soil plugs offer wider planting timeframes, less root disturbance and often a first year growth advantage over bare root seedlings. Bare root seedlings offer affordability and ease of handling during planting. Some of the species offered (Longleaf Pine, Shortleaf Pine) are critical for forest restoration projects. The Nursery tree seedling program does not compete with the ornamental nursery industry. The Nursery utilizes a statewide distribution network of 13 delivery points. This network allows the NCFS to efficiently distribute seedling orders and reduce the travel burden on customers. The Tree Improvement Program maintains orchards for eight high priority species at five locations across the state. These grafted orchards are located in climate zones suitable for the species being produced and are located to spread the risk of a catastrophic event such a hurricane causing complete loss of the material. Tree Improvement Program orchards produce seed used to grow trees with improved growth rates, increased disease resistance and have better characteristics needed for producing quality forest products. For example, the time needed to grow a commercially mature stand of Loblolly Pine has been reduced from about 45-50 years down to 30-35 years as a result of genetic gains from the Tree Improvement Program. In addition to seed collected from its orchards, The Tree Improvement Program coordinates the annual hardwood seed collection needs. More than 50,000 pounds of hardwood seeds are collected from across the state annually. This seed is brought to Claridge Nursery, cleaned, processed and transferred to the Nursery Program for planting. The Tree Improvement Program was the first state agency member of the North Carolina State University Tree Improvement Cooperative in 1964 and has maintained its membership ever since. This cooperative, along with its many member partners, has advanced the genetic improvement of Loblolly Pine into its fourth cycle of breeding. Loblolly pine is the species of choice for the southern forest industry. Loblolly Pine seedlings offered by NCFS are ranked by the Loblolly Pine Performance Rating System. This user friendly way of comparing growth potential among different families allows customers to easily compare traits of one family against others. Prior to this system, information of this kind was only available to forest industry. Genetic testing to determine new selections of priority species is an ongoing process. This testing identifies selections worthy of deploying, and also identifies lessor performing selections that need to be removed from production. Species currently undergoing intensive genetic testing include Loblolly Pine, Longleaf Pine, Atlantic White Cedar and Eastern White Pine. The mission of the Nursery and Tree Improvement Program is critical to the success of landowners in North Carolina. The program is necessary to make sure that citizens of North Carolina have access to the best genetics available for use on their land. Just as important is the assurance that the seedlings produced come from native trees of our state and are geographically suitable. In addition, the advanced selections of Loblolly Pine come with easy to understand ratings that have third party certification through the North Carolina State University Tree Improvement Cooperative. 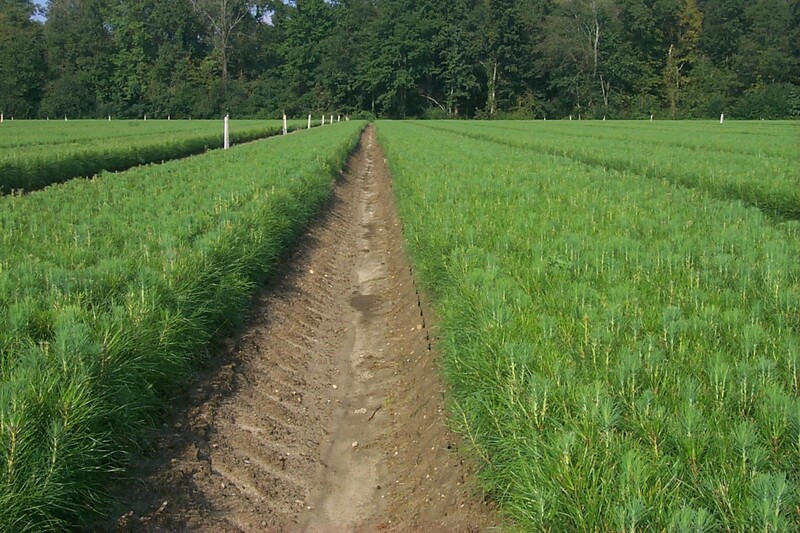 By offering seedlings in a variety of order quantities, customers of all sizes are serviced. Regardless if a customer needs as few as 10 seedlings or as much as several thousand, the program serves all North Carolinians.